Who invented Duct Tape? The woman who had the idea that led to the invention of Duct tape was Vesta Stoudt (1891 - 1966) of Prophetstown a city in Whiteside County, Illinois, United States. Vesta Stoudt passed her suggestion to President Franklin Roosevelt during WW2 (1939 - 1945). The War Production Board forwarded Vesta Stoudt's proposal to a division of Johnson and Johnson that developed various types of tapes for the industrial market. A team at Johnson and Johnson Permacel Division, headed by Johnny Denoye and Bill Gross, developed the product in 1942, during the WW2 period of invention (1939 - 1945). 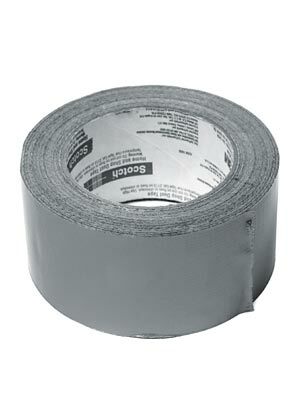 Definition of Duct Tape: Duct Tape is defined as a type of strong waterproof adhesive take (specifically masking tape) typically made of silver-colored, mesh coated cloth. It was originally designed (in a green color) for the military during WW2 to keep moisture out of the ammunition cases. Is it Duck Tape or Duct Tape? Its waterproof qualities and mallard green color led to the nickname "Duck Tape". The tape was so versatile that it gained a vast variety of other uses and repair work. After the war it was used to connect heating and air conditioning ducts and manufacturers changed the color to silver to match the ducts which led to its name "Duct Tape". Fact 1: Who invented Duct Tape? Duct Tape was invented by Vesta Stoudt and the product was developed by Johnson and Johnson Permacel Division in 1942 during the WW2 Era (1939 - 1945). Fact 2: Who invented Duct Tape? Prior to the invention of Duct Tape in 1942, the box flaps of waxed ammunition boxes were sealed with tabs made with thin paper tape. The paper-thin pull tabs were not strong enough and frequently came off leaving soldiers, often under the pressure of enemy fire, desperately clawing open the boxes to get to their ammo. Fact 3: Who invented Duct Tape? It took the persistence of Vesta Stoudt to get someone to resolve this seemingly trivial problem which could be costing the lives of soldiers who were fighting for their country. Fact 4: Who invented Duct Tape? The inventor of duct tape, Vesta Stoudt, was born in Prophetstown a city in Whiteside County, Illinois. Her father was Ulysses Simpson Grant Wildman (1864 - 1958) and her mother's name was Gertrude Caroline Johnson Wildman (1872 - 1955). Fact 5: Who invented Duct Tape? Vesta Wildman married Harry Issac Stoudt (1886 - 1954) and the couple had two sons, Raymond and Clarence and two daughters named Ruth and Donna who they raised in Sterling, Whiteside County. Fact 6: Who invented Duct Tape? The life of Vesta Stoudt was turned upside down when WW2 broke out. Her two sons were enlisted in the Navy. Like so many women of the era, Vesta Stoudt took a job at the self contained Green River Arsenal between Dixon and Amboy in Lee County, Illinois to play her part in the war effort on the home front. Fact 7: Who invented Duct Tape? The Green River Ordnance Plant (GROP) was a large munitions factory complex that had been rapidly constructed in 1942. The "Green Riverites" were mainly women, housewives who had never worked before, who soon became used to handling ammunition and explosives. Fact 8: Who invented Duct Tape? The Green River Ordnance Plant employed some 4,500 workers working with bombs, bazookas, rifle grenades, shells, detonators and live ammunition. Vesta Stoudt was just one of these patriotic Americans who wanted to help their country. Fact 10: Who invented Duct Tape? After packing 11 cartridges in their strong, waxed, waterproof and damp-proof box Vesta Stoudt began to notice that the thin paper tape used to seal the box flaps was just not up to the job. Fact 11: Who invented Duct Tape? The thin paper tape was just not strong enough, it came off two easily which would leave soldiers with no alternative but to prise the wax coated boxes apart with their fingers. Fact 12: Who invented Duct Tape? As the mother of two Navy sailors Vesta Stoudt became convinced that the problem could result in lost lives. Fact 13: Who invented Duct Tape? Vesta Stoudt came up with a solution when she had the idea of using a strong, waterproof, cloth-backed tape to seal the seams and make a new pull tab that could be opened in a split second. She put her idea of using a fabric tape to her supervisors and to Ordnance Plant inspectors but their response was less than enthusiastic and she could find no one would would take her idea seriously. Fact 14: Who invented Duct Tape? The tenacious Vesta Stoudt was absolutely convinced that her idea was right and she wrote a letter to the President of the United States, Franklin Roosevelt, outlining her idea and enclosing a diagram. Like other patriotic Americans Vesta Stoudt listened on the radio to FDR's 'Fireside Chats'. These informal 'Fireside Chats' enabled the president to speak directly to the American people as if they were close friends and Vesta Stoudt felt confident that FDR would listen to her. Fact 15: Who invented Duct Tape? Vesta Stoudt was right. President Franklin Roosevelt did listen and her idea was passed to War Production Board and Vesta Stoudt's proposal was forwarded to a division of Johnson and Johnson that developed various types of industrial tapes. Fact 16: Who invented Duct Tape? Vesta Stoudt heard nothing further about the progress of her invention. This was not unusual as during the war all new ideas were classified as 'Top Secret'. Fact 17: Who invented Duct Tape? Her idea had been passed to a team at Johnson and Johnson Permacel Division, headed by Johnny Denoye and Bill Gross, who developed a prototype for the product and Duct Tape was produced in 1942. Fact 18: Who invented Duct Tape? Johnson & Johnson's new product was made of thin, lightweight fabric known as cotton duck, duck cloth or duck canvas. The cotton duck cloth was coated in waterproof polyethylene plastic and its reverse had a layer of rubber-based gray adhesive that Johnson & Johnson branded as "Polycoat". Fact 19: Who invented Duct Tape? The new product was colored in matte olive drab color as a standard military shade. It was nicknamed "duck tape" by the soldiers, perhaps after the duck cloth material but more likely as a humerous reference to green colored mallard ducks. Fact 20: Who invented Duct Tape? The "duck tape" was easy to apply and remove, the main requirement for Vesta Stoudt's idea. Thre product was strong but could easily ripped off without the use of a knife or scissors. The new product was so successful that it was soon adapted to make emergency repairs to different types of military equipment, including vehicles and weapons. Fact 21: Who invented Duct Tape? On March 26, 1943 Vesta Stoudt received a letter from Howard Coonley, a director of War Production Board, telling her that her idea had been approved and commented that her idea was of "exceptional merit". Fact 22: Who invented Duct Tape? WW2 ended in 1945 and the versatile "Duck Tape" was adapted to suit various industries and popular for helping with household repairs. It was particularly useful for connecting heating and air conditioning ducts and manufacturers changed the color of the product to silver to match the ducts - which led to its name "Duct Tape". Fact 23: Who invented Duct Tape? Vesta O Stoudt, the inventor of Duct Tape, died on May 9, 1966 at the Whiteside County Nursing home, Illinois following a long illness and was buried in Oak Knoll Memorial Park Sterling. Who Invented Duct Tape - Vesta Stoudt - Inventor of Duct Tape - Invention - Definition - Meaning - Famous - Duct Tape History - Origin - Innovation - Important - Significant - Development - Duct Tape - First - Definition - Kids - Duct Tape History - Amazing - Best - Facts - Information - Info - Who invented Duct Tape - Dates - When - Why - Impact - Purpose - Duct Tape History - Use - Interesting - New - Old - Definition - Meaning - Awesome - Cool - American - Duct Tape History - Who invented Duct Tape?